Learning & Development (L&D) professionals must create awareness to impact today’s learner sustainably. Just like content marketers do, they need innovative tactics to conquer the “distraction” problem that looms over contemporary workplaces. Today, marketing and L&D departments share the same side of the table, both searching for ideal engagement strategies. Because L&D professionals and marketers have similar goals, they can adopt each other’s tools. In other words, L&D specialists have a wealth of possibilities waiting for them in the world of digital content marketing. According to the Towards Maturity report, 61% of L&D leaders lack a clear communications policy for engaging consumer learners. The same is true when it comes to employee engagement rates in the workplace. Gallup studies conducted in 2016 show that approximately 17.2% of the workforce in the U.S. is actively disengaged. When social media rose to prominence in the early 2000s, few predicted that these platforms would bring so many new opportunities for brands to engage and entertain new and existing customers as well as their own employees. Certainly, this new era brought challenges in addition to opportunities. 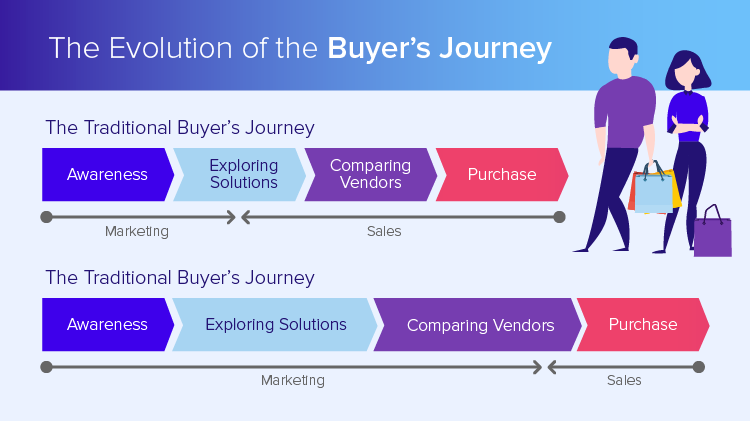 Buyers’ and the learners’ journeys changed completely, becoming more complex than ever. To better understand this reality, let’s quickly examine the buyer’s journey. The graphic below illustrates how the buyer progresses toward deciding on a typical purchase. A recent study conducted by GE Capital Retail Bank confirms that 81% of potential buyers search for products and related information online before making a purchase in a store. Also, according to a Pew Research Center survey, eight out of every ten Americans have made some kind of online purchase. This shows us how, in our current situation, the buyer rather than the salesperson has become the expert. Digital marketing has fully taken the place of traditional marketing. To engage today’s modern buyers and make them feel less led, marketers need more relevant, higher quality content and a well-structured content strategy. Like contemporary buyers, today’s learners are also undergoing a significant transformation. On the one hand, training has never been more essential--companies need their employees to bridge skill gaps to solve more complex challenges and ensure consistency. On the other hand, the overly full schedules of today’s employees leave less time for any training at all. In this current atmosphere, employees must be compelled to learn in the same way marketers catch the attention of busy consumers. Luckily, L&D can incorporate marketing strategies in building excitement and momentum around learning. 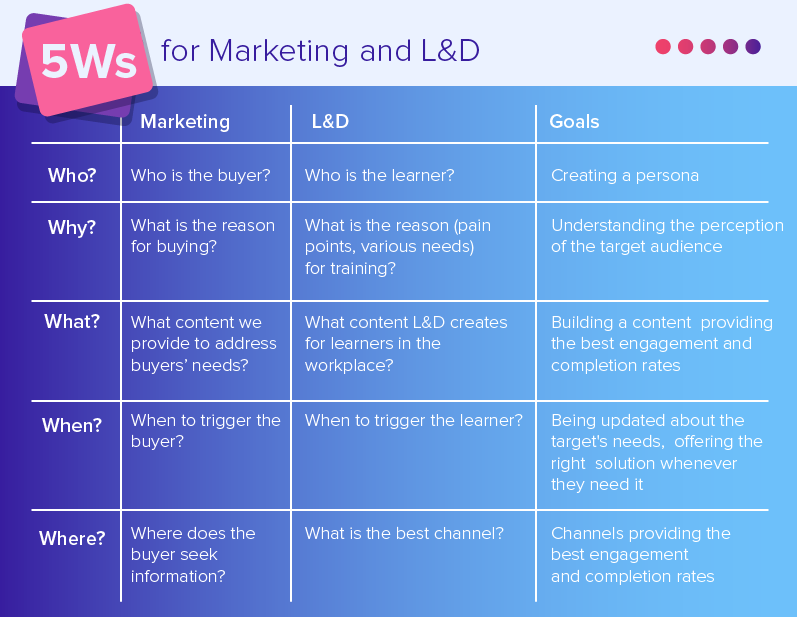 Asking the 5W questions led content marketers to design an effective buyer’s journey and will also prove crucial in helping L&D specialists understand the learner’s journey. How do L&D professionals best benefit from Content Marketing strategies? Positioning the L&D team’s brand effectively is key to creating more meaningful learning experiences for employees. 3M’s L&D department offers a practical example of how to do this. 3M’s Catalyst Program is a leadership development program marketed as a “catalyst program,” a framing which sparks ideas of innovation and gives employees a more powerful perception of the brand. Microsoft’s growth-mindset culture also helps employees perceive the company’s brand as strong. Under the CEO Satya Nadella’s management, learning and creativity have been framed as increasing the leadership potential of every employee, not only those with already “high potential.” Several programs reflect Microsoft‘s mindset, including hackathons, talent programs, and high-risk projects. By giving more individuals opportunities to become leaders, Microsoft creates a sustainable development culture for all employees and also becomes more attractive to new ones. According to Nadella, this culture has already shown considerable benefits, with employees proposing and envisioning increasingly innovative ideas and products. Like content marketers, L&D professionals must understand the needs and demands of their audience. In his HBR article, Josh Bersin gives a remarkable example of the importance of personas in L&D. He discusses a telecommunications company that experienced high turn-over, then found a solution through “journey mapping,” a process that allowed executives to understand their employees better. This mapping revealed the company’s urgent learning needs and helped them improve all of their business processes. This video was central to Apple’s “Think Different” campaign, which won the 1998 Emmy Award for Best Commercial and serves as a perfect example of effective emotional marketing. Good storytelling engages consumers on a subconscious level and emotionally connects them with the brand and its narrative. Engaging, nurturing and impacting learners long-term requires that L&D departments understand the emotions, expectations, and challenges of their audience. “If we’ve created a learning program or course that genuinely addresses the real-life challenges of our employees, more than 90% of registrants attend,“ says Regis Courtemanche, Former Director of L&D at BuzzFeed. Marketers use multiple effective channels that could benefit L&D leaders. Choosing the best channel for the organization is a crucial step in the marketing journey. Perhaps the ideal channel is a blog that allows L&D leaders to craft unique articles, or a microsite for nurturing helpful interactions between employees, or games, quizzes, competitions, case studies, infographics, testimonials, e-books, podcasts or videos. The possibilities are vast. In today’s fast-paced L&D environments, effectively engaging and nurturing employees means offering them diverse resources and content. To do this, L&D specialists must begin by studying their audience and discovering what they do and do not care about. This newfound, accurate knowledge will make it much easier to build compelling content and share it through proper mediums using proven content marketing strategies. Build your brand: Express your identity and ensure its visibility. Choose a name for your team and decide on your L&D vision. This will enable you to maintain consistency for your employees and even stand out amongst the countless other training departments and concepts out there. Use personas to more deeply understand your employees: Personas will reveal different views, behaviors and needs, and help you recognize which responses will best resonate with employees. Developing accurate learner personas and a suitable learning program will lead to the best value. Focus on the journey: Create an immersive, contextual learning journey just as marketers create consumer journeys. Consider the discovery, consideration and decision stages, and always keep the 5Ws in mind. Develop an emotional connection: Develop emotional connections just like big brands do through their advertising. Since emotions have the most power, why not hone strong emotional connections to shape a learner’s behaviors and encourage self-improvement? Emotional appeals grab learners’ attention and make answering their more tedious questions and actively engaging them in fruitful training programs easier. Create unique content: Remember to build a strong L&D vision. Create unique and relevant content by addressing a learner’s expectations and challenges, and choose the best medium to achieve optimal engagement and completion rates. Integrate animated video: Imagine that you have a strong training content, but a weak medium unlikely to compel your audience to learn or take action. Video is often the best medium for training content, as it engages the audience and makes learning over a short time span more efficient. The question is, should video content be live-action or computer-animated? According to “12 Principles of Multimedia Learning” by Richard E. Mayer, content presented through animation (motion graphics and visual metaphors) teaches content more effectively. Be aware of the power of motion graphics in learning. Take advantage of the effectiveness of animated videos to tell a story, engage learners and encourage interaction. Be mobile: The global mobile workforce is expected to increase in the near future, representing 42.5% of the total global workforce by 2022. Primarily because finding time to learn remains a major challenge, learners need mobile learning management systems accessible from any place and any time. Build your own efficient mobile LMS system that allows every individual learner to reach you whenever they are available. Use a variety of distribution channels: Expand your distribution channels by using a wide range of tools—including intranet, corporate blogs, Slack, emails, Skype, WhatsApp groups or even face-to-face meetings—to engage your employees and convey your message. Keep communicating: A well-structured communication plan can efficiently help, memorably deliver your message across multiple channels. Keep your message clear and consistent as you develop your learning approach and marketing campaign. Track and report: Use a tracking mechanism to collect data and measure the success of your training programs. This enables you to consistently improve the quality of your learning content and create more user-focused programs. Want to read more about how to overcome L&D-related engagement problems?